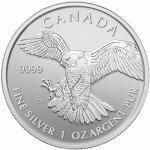 The Silver Canadian Maple Leaf is recognized around the globe as one of the highest quality sovereign coins produced today. One of the remarkable features of the Silver Canadian Maple Leaf is dedication to design. The Royal Canadian Mint uses the same imagery on each side of the coin each year. The 2015 1 oz Goat Privy Silver Canadian Maple Leaf Coins feature a minor addition to the otherwise standard design of one of the world’s most popular coins. These coins also contain 1 troy ounce of .9999 pure silver, however they feature a frosted finish with a sheep privy mark on their reverse. 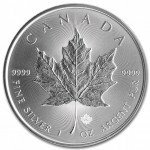 Silver Canadian Maple Leaf coins were first introduced by the Royal Canadian Mint in 1988. The design used on the coin was taken from the Gold Maple Leaf program which had been launched nine years earlier. Each year, the image of a maple leaf appears on the reverse, while a portrait image of England’s Queen Elizabeth II is featured on the obverse. The 2015 1 oz Goat Privy Silver Canadian Maple Leaf coin celebrates the Year of the Goat on the Chinese Lunar Calendar by including a small goat on the reverse side of the coin. On coin’s reverse is the traditional image of a maple leaf. Engravings on this side include “Canada,” the weight, and metal content of the coin. On either side of the maple leaf, the purity of the coin is engraved. At the base of the leaf’s stem, a small goat privy stamp is included to honor the Year of the Goat. The obverse side of the coin bears Susana Blunt’s right-profile portrait of Queen Elizabeth II. Her Majesty’s image is surrounded by engravings of “Elizabeth II,” the face value of the coin in Canadian dollars (CAD), and the year of minting. The Royal Canadian Mint was founded in 1908 to support the processing and refinement of precious metals discovered in the Yukon Territories. Throughout its history, the mint has handled gold bar production to finance Great Britain’s World War I efforts, and minted some of the purest silver and gold bullion products the world has ever seen. 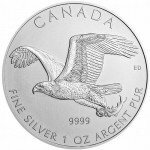 If you have questions about the 2015 1 oz Sheep Privy Silver Canadian Maple Leaf, other Silver.com products, or the online purchasing process, simply call our associates at 888-989-7223. You can also speak with a representative online through our website’s live chat feature.